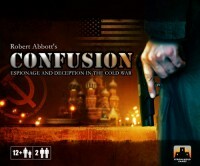 Confusion: Espionage and Deception in the Cold War takes players back to the early 1960s and the Cold War between the United States and the USSR. Each player takes on the role of their selected nation's spy agency: the CIA or the KGB. Confusion is a game of deduction and area control, as you determine how to influence your Spies, control the global spy network, and deliver the Top Secret Briefcase to win the game! At the start of a game of Confusion, players aren't aware of the talents and skills their spies possess! Your opponent can see what your spies can do, but you cannot. Your job as a wise leader is to first deduce exactly how each of your spies move, then employ your knowledge by using each spy for maximum effect. But be on alert, because your opponent has placed a double-agent in your team of spies! The first player to take the Top Secret Briefcase from the middle of the board and deliver it to his opponent's side of the board is the winner! Jeremy's notes: Confusion: Espionage and Deception in the Cold War is a remake of a classic 1992 Robert Abbott abstract strategy game. Although its heritage most certainly falls in line with games like Checkers and Chess, it does introduce a splash of deduction to create an incredibly intelligent game that requires a heavy dose of tactics and strategy to succeed. Wonderful production values and inspiring gameplay make this one a keeper. Richard Abbot’s Confusion was a relatively obscure abstract game first published in 1992, but thanks to the excellent 2011 reprint by Stronghold Games it has now burst back onto the scene where it can shine once and for all. Confusion borrows elements from a number of other well-known abstract games like Chess and Stratego, but also adds in a very clever deduction aspect that makes it a game that plays like no other. The basic goal of the game is to move your pieces to pick up the briefcase in the center of the board and then carry it past your opponent’s pieces and into their first row. If you move to a space occupied by an opposing piece you capture it and remove it from the board (similar to Chess), but the tricky part to the game is that at the start you have no idea how any of your pieces can move, and that’s where the deduction comes in. Each piece has a randomly selected insert that indicates how it can move in some combination of forward, backward, side-to-side, and diagonal, and from 1 to 4 spaces. Every combination is unique, and they’re placed on the board so that only your opponent can see the markings. Your job is to figure out how each piece moves, and you do that each turn by selecting a piece and asking your opponent if it can make a specific movement, to which they give a “yes” or “no” answer. If it was a “yes” you make that move with the piece, but if it’s a no you leave it where it was. In either case, you’ve learned important information that will help you narrow down the identity of the piece, which in turn will allow you to make a run for the briefcase and ultimately win the game. Further complicating matters is the double agent, a piece that shows a question mark (?) instead of a specific movement type. When you attempt to move that piece your opponent is free to tell you whatever they want, even if it contradicts a movement they allowed it to make earlier in the game. As clever and thought-provoking as the gameplay can be, the components in this edition are even better. Stronghold went all-out, and made all of the pieces and their inserts from a hard plastic (similar to bakelite). They’ve got a really nice weight to them, and look fantastic. The board is made of high-quality material with great artwork, and even the player boards (used to track all of the movement information) are exceptionally well done (they’re almost like having extra gameboards in the box). Some dry-erase markers are included so you don’t have to burn through paper tablets every time you play, and as an added touch there are six extra round cardboard tokens that are included for use with one of several variants listed in the rulebook. Like most abstract games I could see the replay value of this game eventually going down as certain strategies or play styles become dominant, but because of the random arrangement of the pieces and the numerous variant rules included, it should be a very long time before anyone reaches that point. The only other real downside to the game is that it only works with two players so it may not be suitable for a game night with a lot of people present other than as a way for a few players to pass the time while another game finishes up, but it’s perfect for couples enjoying an evening together or even those times when it’s just you and one other person, where all of those games that need three or more players simply aren’t an option. I absolutely fell in love with this game. It is a game of strategic deduction and positioning to accomplish the “W”. You will start off every turn moving a spy to a spot on the board, and your opponent will tell you if that is a legal move for your spy or it is not. You then can mark in your secret spy folder the new information you have been given. You will take the knowledge you have learned from previous turns to capture the briefcase or other spies. But there is a twist, did the opponent lie to you about how your that spy could move? Could that spy just happen to be the double agent? These are just a few of the aspects in this game that I absolutely love. Now lets move onto the components. This game comes with 26 uniquely-designed, two-piece, Bakelite-style, “Spy” playing pieces and 1 Top Secret Briefcase. The design of the pieces are absolutely genius, the quality is awesome. They didn’t hold back on there components quality which seems to be a trend that Stronghold Games seems to have. Take a look at the “Spy” pieces for yourself. The last thing I want to say about the Spy pieces is explain what the symbols on the front mean. The first thing you will see is a Letter at the top of the piece to distinguish which piece is which. Then there is some arrows in three different positions on the piece, (top, middle, and bottom) these arrows show the directions this piece can move. Then there is a number, a lock, and/or a crown on the very bottom. In the above picture “Spy” piece A can move diagonally backwords 1 square (black arrows), either direction straight sideways (green arrows), or diagonally forward 1 square (red arrows). The 1 at the bottom shows how many spaces this piece can move. Now not shown on this specific piece is the lock and crown. The lock is used as reference only and just shows that the individual piece may not be able to return to the space it was previously on. The crown is a really cool idea. It gives that spy the ability to be promoted. To be promoted you must take that spy to the opponents back row on his side of the board (think “king me” in checkers). After being promoted the piece can move 2 spaces in any direction. The next component I want to mention is the Spy Notebook. Having your own personal dry erase spy notebook is key to figuring out your spies talents and movement capabilities. Having a dry erase marker, these notebooks can be used over and over again and again. I love this concept and it made me happy to not have to use pre-printed pieces of paper like in yahtzee. The other pieces that should me mentioned is the playing board, 6 action tokens, and rule books. The action tokens are used for a variant of the game mentioned in the rulebook. Here is a picture of the play board. The last thing I want to mention as far as components is the rule book. Everything is covered clearly and without any “Confusion” which is always a plus. Stronghold Games continues to be the “Lazarus Pit” of the board gaming world – resurrecting classic, long out-of-print games for a whole new audience, and giving them the dazzling makeovers these games deserve. Overall, this is a huge hit and a great choice of a game for Stronghold to revamp. There will be a great number of InD20 Group members that pick this game up. I believe that Stronghold Games will be a force to be reckoned with if they keep up what they are doing. I have two more games to review from Stronghold and I cannot wait to bring those to your viewing pleasure. Larry Fettinger and InD20 Group approve this review and give it 9 out of 10. The Cold War. A dangerous time for the world. A dangerous time to be a spy…but that is exactly what being a spy is all about. Therein is the introduction to Confusion: Espionage and Deception in the Cold War, a two player game that plays in 45 minutes or less. In Confusion, players take on the roles of either the United States or the Soviet Union. Each side is vying for control of a suit-case marked “TOP SECRET” which starts in the center of the board. On your turn, you attempt to move one of your spies in order to advance towards your goal. Yup – I said attempt to move. You see, as the game begins, you don’t really know how each of your spies move – your opponent does. So when you attempt to move a spy, your are actually asking your opponent, “can I move this spy here?”. Your opponent then either says yes or no. If your move was legal, your spy stays in the square into which he moved; if your move was illegal then your spy returns to where he started. Again – your goal is to grab a TOP SECRET briefcase (which starts in the center of the board) and bring it over to your opponents first row. Of course, no spy game would be complete without a bit of conflict – and Confusion has a great simple mechanic for handling this. Move one of your spies (successfully!) onto one of the enemy spies, and that spy is eliminated (without revealing its movement rule to his player). Sound confusing? Agreed. But the game really plays quick and easy – harder to describe than learn for sure. The components in this game are absolutely fantastic – the spy pieces are separate from the movement tiles. Both piece types are nice chunky plastic with embossed and painted evocative symbols. A mounted map-board continues the theme perfectly. To complete the experience, each player has a dry-erase dossier which is used to keep track of which moves are valid or not – both for himself and his opponent. This game isn’t for everyone. If you don’t enjoy deduction, then certainly don’t bother with Confusion. However if you are a fan of light strategic games, then you cannot go wrong in picking up a copy. Personally, I love it. Add a Review for "Confusion: Espionage and Deception in the Cold War"